Enter the world of 19th century France and discover a story of a runaway convict, Jean Valjean, who learns of undeserving forgiveness, heartwarming kindness, tragic sacrifice, and undying love and has a fate intertwined with Cosette and Fantine — a fate that changes all their lives forever. Written by Victor Hugo, Les Miserables is a world-renowned, historical novel that has been converted into a musical, played in front of an audience of over 60 million in the span of 42 countries. Released on December 25, 2012, the Les Miserables movie — starring Hugh Jackman, Amanda Seyfried, and Anne Hathaway and directed by the amazingly gifted Tom Hooper — has materialized the noteworthy musical into a breathtaking film. After the movie premiered, millions of fans have rejuvenated their love for Hugo’s passionate novel and millions of new fans have been born. Join the Les Miserables fan kingdom and uncover the special items that independent sellers have manifested with their talented hands! Whether you’re a mega fan of Les Miserables or you have a special friend who is one, you can celebrate this legendary masterpiece with any one of these original items. 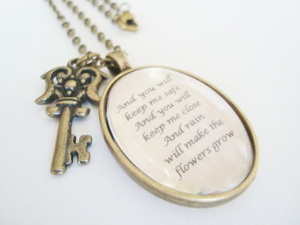 Eponine from Les Miserables sings a song verse into Sweetly Spoken Jewelry’s Les Miserables Quote Pendant! This romantic and antique-looking pendant is charmed with a brass key. The quote is printed on archival paper and sealed with a preserving glaze for appearance enhancement. With each package, Sweetly Spoken Jewelry provides a care card for the pendant. 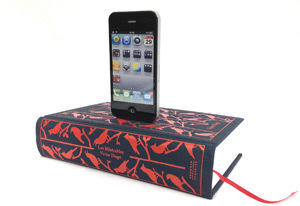 Give your iPhone juice in a fun and stylish way from Rich Neeley Designs’ Les Miserables book dock! You can sync and charge your iPhone or iPod in this decorative dock, which is wrapped in a navy blue cover, sprinkled with vibrant red red birds. The cord hides within the book so that the appealing dock never loses its fanciful appearance! You can choose between 30 pin and Lightning Cable for your dock. Reading the Les Miserables novel not enough? 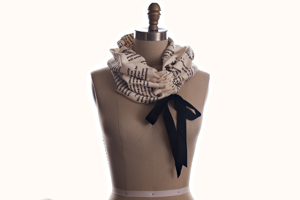 Then wrap yourself in this comforting and quirky Les Miserables book scarf from Storiarts! This brilliantly crafted scarf has been silkscreened with a page from Les Miserables on soft, light fabric, which makes this scarf easy to wear during the summer as well as the winter. Since the words are printed on with heat-set ink, it won’t wash off and you’ll have one of your favorite novels in scarf form that lasts throughout all the seasons! You can also find Les Miserables inspired fingerless gloves in Storiarts shop. 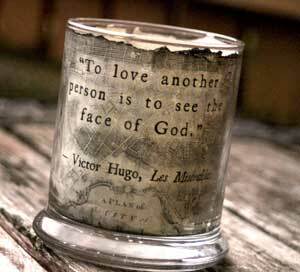 Brighten up any room with the words of Victor Hugo with Genevieve Joyner Designs’ Les Miserables inspired candle holder! “To love another person is to see the face of God” is printed on a antique-looking map of Paris, hand-inked for an extra dimensional element. Genevieve Joyner Designs molds this aged paper into a round candle holder. Not only does Genevieve Joyner Designs create a lovely, vintage candle holder, but they also provide an electric candle with the candle holder to instantly bring a dim and elegant light into your home! Made of paper, this candle holder cannot be exposed to flame, hence the included electric candle. 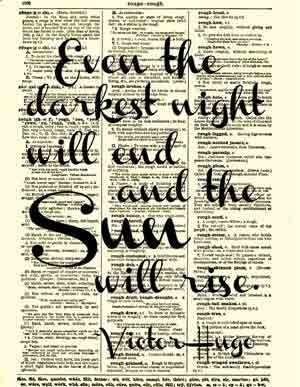 Printed on a 115-year old dictionary page, the Les Miserables quote, “Even the darkest night will end and the sun will rise.”, complements this antique page. Reimagination Prints uses archival ink to print out the elegantly written quote onto the aged dictionary page. Reimagination Prints offers buy two, get one free deals on its unique prints, so stock up on these antique prints to create sophisticated home decor! 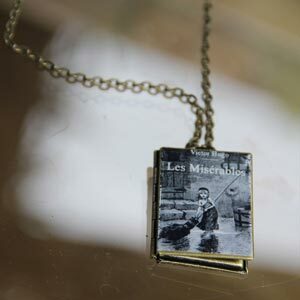 Jazz up your outfit with Sparkle Lab’s Les Miserables book locket! With a glossy front photo and an antique bronze finish, this vintage and polished locket complements the 1800s-based Les Miserables novel. The two hollow ovals inside the locket provides a treasure holding cavity for your photos and miniature knickknacks. You can even brew up your own moisturizing lip balm or scented perfume balm and pour it into the locket for a quick touch-up any time! 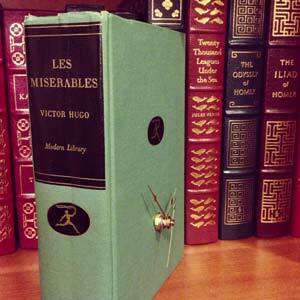 Sparkle Lab offers bulk orders at a lower cost, so if you’re having a Les Miserables themed party, then hand this charming book locket out as gifts for your guests. 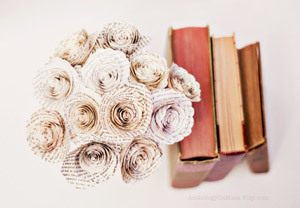 Put favorite book pages together, form them into beautiful flowers, and what do you get? Anthology On Main’s paper-made flower bouquet! Crafted from book pages, this bouquet of flowers is a lovely alternative to live flower bouquets for that special person or even a gift to yourself. Anthology On Main offers a variety of books, including Les Miserables, to choose from to create a personalized bouquet for you. Twelve stem roses are included in this long-lasting bouquet. Bring the touching words of this magical musical to your home with Wish Words Gifts’ art print! Created with a splash of important words and phrases from the music in various color tons of grey and blue, this art print also depicts the famous image of Cosette from Les Miserables. 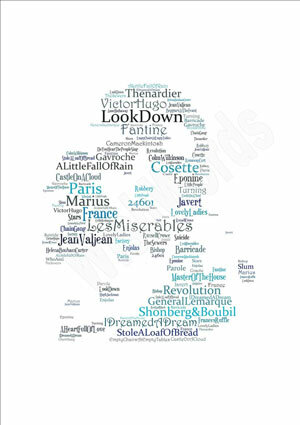 Wish Words Gifts offers this art print in various sizes, from A3 to A5, which gives you the option to create the perfect sized present for the Les Miserables fanatic in your life. 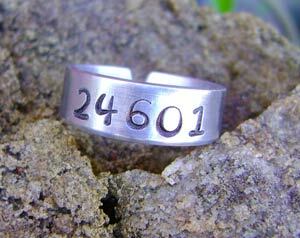 Decorate your finger with this Les Miserables inspired, hand-stamped ring from Metals Heart! With this symbolic number from Les Miserables, 24601, you can honor the famed character, Jean Valijean, with this simple and edgy metal ring. Metals Heart offers customization for this ring as well, so you can have a personalized, meaningful ring. Let your favorite French historical novel help you tell time with eMpTies’ Les Miserables book clock! Imaginative and innovative, this book clock is made from a Les Miserables Modern Library hardcover edition book and clock machinery; all you need is a AA battery to get this book clock running smoothly! Small magnets inside the book secures the clock’s machinery and ensures the book is always closed. eMpTies also offers hanging features for the book clock if you’re interested in hanging the book clock on a wall. Find other great book clocks in eMpTies’ shop! Since Les Miserables has been released, independent crafters are becoming more aware of the movie’s popularity and creating their own unique products to dedicate to the astonishing movie. 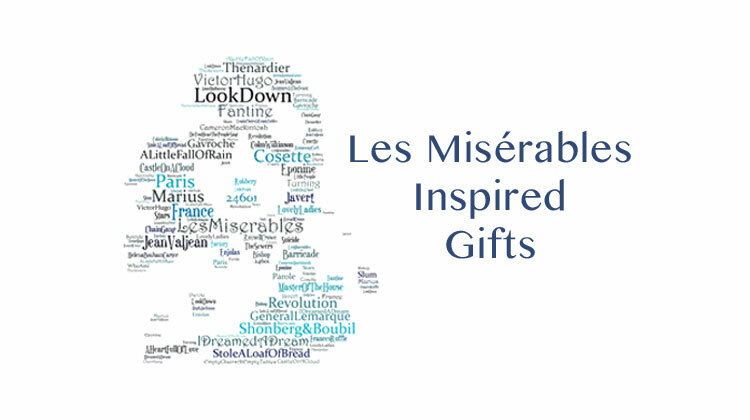 Stay on the lookout for upcoming gifts from sellers to expand your Les Miserables collection!